Our perception of safety at home, in our neighbourhood and on the road contributes to wellbeing and enjoyment of life. When we trust our surroundings and the people in our community, we build social connections and a vibrant Niagara. The national Crime Severity Index has fallen 78.2% over the past 20 years, and the overall crime rate in Canada fell by 54% between 2003 and 2014. Almost 78.7% of Canadians report feeling safe walking alone after dark in their communities; on this measure, over 90% of men feel safe compared to 67.8% of women. Crime rates in Niagara continue to decrease, in line with the national trend. The Niagara Woman Abuse Screening Tool was co-created by 16 Niagara organizations, to align with a provincial initiative. Launched in 2014, the tool provides information about how to support abused women suffering with addictions and/or mental wellness issues; how addictions and mental health organizations can support and safely plan for women dealing with current or historical abuse and trauma; and detailed Niagara-specific referral lists. In 2016 the new Niagara Regional Police Service headquarters opened in Niagara Falls, consolidating five existing police facilities and district operations for Niagara Falls and Niagara-on-the-Lake. The Niagara Youth Court Screening Initiative (NYCSI) tool was launched in 2015 by the Niagara Youth Justice Service Collaborative of 35 agencies, to create pathways to care for youth. The Collaborative supported development of a special Youth Court in St. Catharines, where, in the first year they screened 81 First Appearance Youth. Eighty per cent of these individuals identified with mental health and/or addiction issues. In 2017 NYCSI was extended to the Welland court. The Partnership to End Child Abuse in Niagara (PECAN) is a volunteer-run organization that has partnered with 14 local agencies that provide services for victims of child abuse. In 2017, PECAN launched http://endchildabuseniagara.com/ as a one-stop site to easily access information about available programs, to assist people in helping if they suspect a child is a victim of abuse. The “PORTal” project being piloted in Port Colborne brings the Niagara Regional Police Service and other community partners together to increase community safety and connect people to required social services. They do this by collaboratively identifying individuals experiencing an acutely elevated risk of harm to themselves, their family and/or the community so that appropriate intervention strategies can be implemented to reduce or eliminate this risk. An increasing number of inter-agency partnerships are being formed, that combine complementary front-line worker skills to de-escalate emergency situations, help individuals access required mental health and addictions services, and free up police and ambulance services to respond to other calls. Indigenous organizations in Niagara are working with the justice system to provide culturally-appropriate services such as the Three Fires Community Justice Program of the Niagara Regional Native Centre (NRNC), and the Aboriginal Criminal Court Worker Program of both the Fort Erie Native Friendship Centre and the NRNC. Strengthen impact of the Niagara Youth Court Screening Initiative (NYCSI) tool in St. Catharines and Welland, by emphasizing timely access to mental health and addictions services required by screened individuals. Build on the benefits of integration between law enforcement and agency partners, to achieve balance between community safety measures and early identification of vulnerable individuals who require mental health and addictions services. Continue to improve our understanding of the direct role factors such as food insecurity, lack of affordable housing, employment precarity and under-employment play in child abuse and domestic violence. This includes the impact lack of financial resources has on people remaining in unsafe domestic situations. Support the work of the Niagara Suicide Prevention Coalition to decrease traumatic outcomes for individuals and families dealing with mental health and addictions challenges. 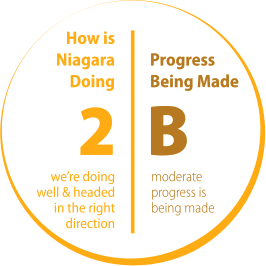 In alignment with Niagara Mental Health and Addictions Charter Principles, enhance working relationships between health system and social service organizations, to ensure a continuum of responsive services is available to meet the needs and requirements of individuals facing mental health and addictions challenges. Pay attention to efforts underway to describe human trafficking in Niagara and take action to reduce its effects on individuals and the community.